Initially inspired by a recipe for golden amaranth superfood bars from At Home in the Whole Food Kitchen by Amy Chaplin, I have made so many changes, these malted superfood bars bear only a passing resemblance to the original. I have previously made the amaranth bars almost per the recipe and they are very good. However, I find hemp seeds can be rather unpleasantly husky and didn’t want my bars overwhelmed with them. The original bars I made were also very crumbly, which made them difficult to cut and eat, so I decided to add some coconut oil to the mix along with a host of other added extras. I also had a We Should Cocoa challenge to prepare for and as the chosen ingredient this month is malt, I thought malt extract would be the ideal sweetener and would help hold the bars together. As chocolate is an integral part of the challenge, a chance to use a bar of Divine’s mango and coconut chocolate was too good an opportunity to miss. I used half of the 100g bar, which meant I was able to savour the rest unadulterated and a very nice bar it proved to be. You could, of course, use any fruit or nut dark chocolate bar that grabs your fancy. I’d already got a vague idea about what I was going to put in my superfood bars; I made sure some of the ingredients were included in my order with wholefood suppliers Suma: roasted almond butter from Carly’s, the above mentioned mango and coconut chocolate bar, dried mulberries, pine nuts, hemp seeds and quinoa pops. In the end I used the pine nuts in one of the many batches I made of wild garlic pesto, but I think the delicate flavour might have been lost in these bars anyway. I happened to have some amaranth pops left over from making the original recipe, but using all quinoa pops would be fine. The bars turned out to be slightly sticky, chewy and crunchy, with bursts of different flavours coming through in every mouthful. An undertone of toothsome maltiness held it all together. 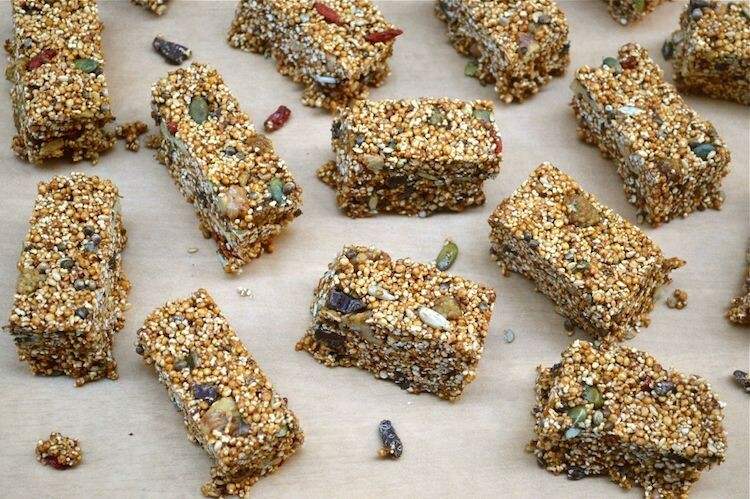 With their understated sweetness, mix of flavours and textures, these superfood bars were a real hit. I’m not sure they can raise the dead, but my mother’s cold started to wane after eating one. Coincidence? Who can tell? These malted superfood bars with mango coconut chocolate are full of nutritious ingredients. They're quick to make and give a boost when body or spirits are flagging. Place the malt extract, almond butter and coconut oil in a small saucepan and place over a gently heat until everything has melted. Stir to mix and allow to cool a little. Toast the walnuts over a medium heat in a dry frying pan for a few minutes until fragrant and golden. Toast the pumpkin, sunflower and sesame seeds for a few minutes in the same pan until the seeds start to pop. Add to the bowl. Add the rest of the dry ingredients except the chocolate to the bowl and stir to mix well. Pour in the malt mixture and mix with the dry ingredients until everything is coated. I found using two spoons together worked well to do this. Add the chocolate last, so it doesn't melt and stir in. Press the mixture into an 20cm (8") sq silicon mould or oiled tin. Leave to set in a cold place for an hour or two. These will keep in an air tight container for a week. You can use 100g of quinoa pops or 100g amaranth pops instead of a mixture of the two. These malted superfood bars with mango and coconut chocolate are my fourth recipe for the Suma Blogger’ Network. They are also my entry to this month’s We Should Cocoa, which is being hosted over at Green Gourmet Giraffe. Johanna has chosen malt as this month’s ingredient to pair with chocolate. I love these, and love the inclusion of the puffed amaranth. Lovely flavours here. These look so good!! Thanks for linking up to my granola bars! Sharing! Thanks Jenn. I’m finding all these relatively healthy bars really exciting. I’m so glad you chose malt Johanna. I don’t think I’d ever have thought of this otherwise and using malt extract as the sweetener / binder has proved to be a great success. All those awesome seeds! I love these bars and NEED a couple of them since I am just done with my morning workout. Hehe, these are so easy Bintu you can knock them up in five minutes flat – almost! wow, there’s a lot going into this but they look SO good… i’m totally into health bars at the moment and will have a go at these… my issue is that I can’t just eat one and then they’re less healthy and more like a treat! As you know I’m a bit of a gannet, but even I find that one of these is enough – for a while at least. They take a while to eat as they are so chewy and then your sort of realise you don’t need any more. These look wonderful – I love that enormous list of seeds! 😀 These would be great for a road trip. I suspect I missed a trick and should have put a few more seeds in, but hey! These look super healthy and delicious for a treat without the guilt. Exactly Nayna and they are so chewy that it takes a while to eat them which is also a bonus. These like they would be super with an afternoon cup of redbush tea! Oh yes indeed Heidi, I’m a fan of redbush tea too. The first batch of these I made were also too crumbly GG, but these seemed to work well. They are fantastic kari. So many flavours and textures going on.